Brussels sprouts often have a bad reputation. But, these tiny buds, if prepared right, can be amazing. It is the perfect side dish, and could be a great addition to your Thanksgiving table. Brussels sprouts are a type of wild cabbage grown for it’s edible buds. They are high in Vitamin A, Vitamin C, Fiber, Folic Acid, and contain high anti-cancer properties. They do best in mild weather, and their peek seasons are anywhere between July and January in North America. Today, I am going to share with you an amazing brussels sprout recipe! I tasted a similar dish at a favorite restaurant of mine, and knew I had to recreate it at home. If you haven’t given brussels sprouts a try for some time, give this recipe a shot, you may quickly reconsider. 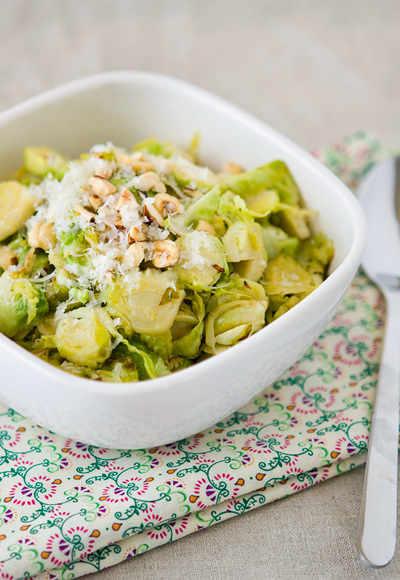 The brussels sprouts are slowly sauteed in butter, and olive oil, and are hit with roasted hazelnuts, cider vinegar, and parmigiano reggiano cheese. Heaven! On a baking sheet, place raw hazelnuts and toast in the oven for 10-15 minutes or until fragrant and toasted. Remove from oven, peel (skin should peel off easily after toasting) and chop. Meanwhile. In a large skillet over medium high heat, heat butter, and olive oil. Add sliced brussel sprouts, and saute for 3-5 minutes until soft. Turn the heat down to medium low and continue to saute, and add hazelnuts and sea salt. Saute for 2-4 minutes. Drizzle with vinegar and stir in well. Place in a serving bowl and top with grated parmigiano reggiano cheese. Serve immediately. i don't know girl… brussel sprouts?! okay, maybe i'll give it a try:) love the blog!